The video streaming market faces many challenges, including new standards, formats, device types, and changing video production and delivery approaches — to succeed, service providers need to work with an experienced quality control (QC) and monitoring solutions provider that can fully address the different needs of the market at various stages of the streaming media workflow, for both live and video-on-demand content. At IBC2017, Interra Systems will showcase their comprehensive approach to QC and monitoring. Interra Systems' enterprise-class, end-to-end solution leads the industry in enabling the delivery of flawless video on every device, in the most efficient and cost-effective manner possible. New features that will be displayed include exhaustive QC checks, ABR stream validation, real-time QoE measurements, live content monitoring, and deep-dive compressed stream analysis. Widely adopted and trusted by operators in the global broadcast, satellite, cable, telco, IPTV, Over-The-Top (OTT) and post-production markets, Interra Systems' solutions are changing the quality of online video and audio. 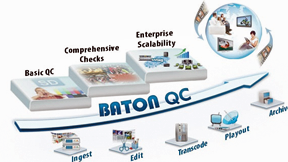 During IBC2017, Interra Systems will also demonstrate its BATON+ QC and analysis solution, which optimizes the QC process by allowing users to define workflows representing the stages through which media content flows in a facility. New data analysis features for BATON+ allow users to effectively track trends and anomalies in the media content, optimizing decision-making and QC operations. The company will also demo new additions to their ORION™ monitoring solutions family. ORION-OTT is one of the industry's first software-based OTT solutions for real-time monitoring of adaptive bitrate (ABR) content for multiscreen service delivery over unmanaged networks. ORION-OTT's software-defined architecture, industry-recognized audio-video QoE, and easy deployability on cloud-based infrastructure makes it truly stand out among its competitors. In addition, Interra Systems will showcase its ORION real-time content monitoring and video analysis system. Being software-based, ORION provides users with a powerful yet economical monitoring solution that runs on standard industry hardware. ORION-OTT's user interface has been enhanced to improve usability. The system now offers wider support for ABR content and DRM, while providing extended monitoring features and checks. New support for Microsoft Smooth Streaming; Dolby AC3/EAC3; HEVC; WebVTT, TTML captions, and more will be showcased. Interra Systems will demonstrate their VEGA™ media analysis solution for standards compliance, debug, and interoperability of encoded streams at IBC2017. Recent updates to the VEGA family include in-depth analysis of ABR formats; support for Windows® 10; the latest HEVC HM reference code; HEVC interlaced streams; VP9 streams (4:2:2, 4:4:4); PCAP streams; Dolby® AC-4 audio; and AVS Plus video. By providing operators with in-depth information about ABR streams, down to the compressed audio and video elementary streams, VEGA ABR speeds up time-to-market for OTT services.